The Fourth Symphony is the last of the Wunderhorn group and a link back to the Third is confirmed by a quote from that work's fourth movement in the finale of this one. After the Fourth Mahler's sound and intellectual world-view would change profoundly, but there was still much to be gleaned from what had meant so much to him in these extraordinary poems. The principal work on the Fourth occupied him in 1899 and 1900, though one of its movements dates from 1892. This is the orchestral setting of the Wunderhorn song "Das Himmlische Leben" ("The Heavenly Life") which he first thought of as finale for his Third only to set it aside and carry it forward to be the unusual finale of this work. Clearly the words detailing heaven as seen through the eyes of a child painted a potent image, and the existence of this movement before the composition of the preceding three tells us this is the ideas "cluster" around which the symphony is constructed. What we have is an examination in music of the special nature of childish perception, specifically as it is brought to bear on those matters Mahler had wrestled with in his two previous works: questions of existence, of what happens after death, of what lies behind the everyday, all with the poems and world of "Des Knaben Wunderhorn" like a beating heart. In the Fourth he would use this connection to lay before us a proposition. Nothing less than that the perceptions of childish innocence are not innocent but, in fact, all-knowing and uniquely percipient. It's a set of ideas he would return to in the future. So in this work there is no actual wrestling with the questions of existence and hardly any concern with conflict and resolution either. For this reason the Fourth is often portrayed as Mahler's least troubled work and there is some truth in this on a surface level. It certainly means there is less the conductor can do to harm it and this is reflected in the recordings under discussion where differences are quite slight, unlike those that present themselves when recordings of the Second are compared, for example. For this reason my core selections of recordings remain constant in this revision though there are some new versions to be considered and one final thought to the future at the end. Since this is Mahler's shortest symphony and the one with the prettiest and most tuneful textures it's earned its place as his most popular and approachable. But be careful about viewing it as entirely untroubled. There are dark shades cast on the filigree textures and piquant colours, as Deryck Cooke recognised when he wrote of "figures moving behind a veil which obscures their naked horror and makes them like the bogeymen which appear in illustrations to books of fairy tales." Grimm rather than Anderson, then. For the conductor this has always meant a balancing act. Accentuate the dark elements, pile the work with too much emotional drag, and the special fairy tale nature is lost. But play down the shadows, take too far a step back, and those bogeymen disappear from view. Most conductors pull off the trick admirably and tell us this is one Mahler work whose secrets may have been unlocked. But there are still comparisons to be made in a field of excellence and still a case to be made for selecting what I believe is the "crème de la crème" which is what I shall now do. This is the only complete Mahler symphony where we can compare and contrast recordings by the two conductors most closely associated with Mahler's work in his lifetime: Willem Mengelberg and Bruno Walter. 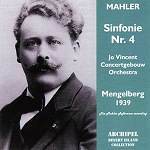 Mengelberg sat in the audience in Amsterdam in 1904 to hear Mahler conduct the symphony with the Concertgebouw Orchestra twice in the same concert. He also attended the rehearsals, discussed the work with Mahler, and made copious notes in his score with Mahler's co-operation. Mahler in turn had a very high opinion of Mengelberg's conducting of his music so any recording by the Dutchman must carry a degree of authenticity but with the caveats that need to be applied to that word in this context. Whether what we hear in the "live" concert recording from November 1939 (Archipel ARPCD006) can be said to represent Mahler's own wishes is another question. I would only point out that by this time twenty-eight years had passed since Mahler's death and Mengelberg, a conductor known for a very expressive style, must have developed his interpretation in those years however much it may have been influenced by Mahler to start with. However, I think we can say this recording gives us a window into the way the generation nearest to the composer saw and performed his works. If you are only used to more recent recordings the opening will come as a shock and the shock will hardly leave you as the work proceeds. Mengelberg is more mannered and more moulded than anyone else, with sharply accentuated tempo changes forward and back, often in the space of a few bars. This extreme interventionism continues right through the work but in the first movement especially. Passages of nostalgic repose are delivered with every ounce of care and feeling, wrung from them like ripe fruit being made to yield every drop of juice. The movement contains a double Exposition and it's in the second of these you also hear the full treatment of string slides the era this performance comes from, and which Mengelberg's and Mahler's audiences would have been used to and have expected, provides. But Mengelberg is good at the menacing shadows of the work, the lyricism and the nostalgia. Though I do wonder how much we today have ears that can take the bar-to-bar control he exercises, however brilliantly or authentically. In spite of his interventions, though, the underlying pulse of the music never flags. You know Mengelberg's intimate knowledge of this music, and that of his orchestra with it and his methods, means there is clear vision right through and it's this which ultimately saves the recording and makes for a remarkable experience. In the centre of the movement comes one of the few points of real crisis as the music is whipped into a dissonance that comes down on a trumpet fanfare Mahler will later recall at the start of his Fifth Symphony. Mengelberg's treatment of this shows him aware of the link forward, but he is also aware enough of the internal structure of the movement to make the clinching climax that follows it soon after more imposing where nostalgia and good humour carry the day. Following this, Mengelberg's second movement sees very much the same approach. He invests every bar with character and detail. We also hear what a superb instrument the pre-war Concertgebouw was and how at home they were with Mahler's music. Note especially the mellow sound of the superb principal horn. In general this is an orchestral style and sound now lost in an age where orchestras sound alike. The slow movement is one of Mahler's most noble and moving creations. A vision of a child asleep in death carved in stone atop a tomb was in his mind. Mengelberg and his players rise to the occasion with an account that, more than most with his expressive style, shows the ebbs and flows to superb effect. Mengelberg's interventions also seem less pronounced than in the first movement and I am struck by a wonderful honesty that more than confirms the high regard Mahler felt for his friend's work. The playing of the woodwind is a special delight and also the piercing solo trumpet at the climax. So this is an important recording, a recording that can be enjoyed on its own merits irrespective of historic nature, even though a deep breath might be needed for those who prefer their Mahler more circumspect. The mono sound may be a big problem for some too. It was recorded on discs and these have a degree of surface noise. But if you can listen through this, and the slightly pinched quality of the sound, you will come to regard this performance as an essential supplement. Mengelberg’s successor at the Concertgebouw, Eduard Van Beinum, did sterling service restoring Mahler to the European continent in the 1950s following the music’s banning by the Nazi occupation. In 1951 he recorded the Fourth for Decca and whilst it may be hard to find this is still worth seeking out for those interested in an age of Mahler interpretation now sadly lost to us. However, if you are expecting a Mengelberg-like interpretation you will be surprised. He is swift and classically-thorough, an antidote to Mengelberg and to Walter whose recording was made four years earlier. What Van Beinum might take away in warmth and personal involvement is balanced by the Concertgebouw players whose experience under Mengelberg must still have been potent so what you are left with is a superb balance of head and heart with head just predominating. Margaret Richie is a wonderful soloist too and whilst this fine Decca mono recording can never be a front line choice it must be in the pantheon of Mahler Fourths. 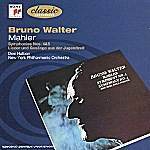 There are a number of recordings of the Fourth by Mahler's friend, assistant and disciple Bruno Walter available but I'm going to deal with the one made in New York in 1946 (Sony 5153012 coupled with the Fifth, or Naxos 8.110876) as broadly speaking his interpretation remained the same and this one is the easiest to obtain as well a being the only official one he ever made. Comparing him with Mengelberg's recording is especially interesting in that it warns us straight away not to be too quick to regard one way of playing Mahler as authentic. Walter knew Mahler even better than Mengelberg did. He also heard Mahler perform this and other of his works. So it's fascinating to hear Walter take a different approach, much less mannered, much less indulgent. One caveat must be made, however. Though this New York recording was made on discs which allowed takes of around sixteen minutes, Walter would have had to take note of the fact that it would be issued on 78rpm sides of around four minutes. This must have had an effect on some of the overall tempi adopted. Indeed, in an interview with Mahler biographer Henry-Louis de La Grange, the recording's soprano in the last movement Desi Halban confirmed this to be the case. That said, Walter's recording also deserves its place in the Fourth's discography, both as historic document and also a recording to be enjoyed on its own merits. I like the lighter, more pastoral approach Walter adopts at the start because this is allied to a definite underlying tread that never seems to leave him. It's a remarkable effect, a tempo that allows for a degree of expression that doesn't weight the music down with unnecessary mannerism. There is some quite tart playing from the woodwinds to which gives him the opportunity to respond to the special sound of this work and balance Deryck Cooke's ghosts with the good humour. There is a price to pay. The climax on the dissonance is not as deep or profound as Mengelberg's, or some of the other conductors we will deal with. Also the symphonic thread is maintained, it seems to me, at some cost to the little amount of conflict there is in the work. But Walter's good sense is very engaging. In the second movement Walter makes his solo violinist sound more sinister than Mengelberg and this is correct as Mahler asks the player to tune his instrument up a tone to sound more diabolical. This, according to Mahler, is "Friend Death" leading a dance rather in the manner of the Pied Piper - Death as friend, a beguiling character. The playing of the New York Philharmonic, another great Mahler orchestra, is full of character and security, fully aware of the idiom in which they are playing. Walter's account of the third movement is broad and noble but it moves forwards a little more than Mengelberg and so seems more true to Mahler's marking of "Restful" than Mengelberg's who, in comparison only, appears more troubled. This, as so often with Walter in Mahler's slow movements, carries the feeling of the Lied, and we must never forget how much of Mahler is allied to song. A feeling confirmed when the last movement enters. Even though a quite fast overall tempo is adopted, Desi Halban is encouraged to sing out rather than meld into the texture. Halban has a very distinctive voice too, not an especially attractive one, not the usual creamy modern "diva" soprano we are often used to, and I believe this is a gain. One of the great pities of recordings of this work is that none of the sopranos achieves the childlike quality Mahler wanted and neither does Desi Halban quite. But at least she's distinctive, at least she has character. One day a conductor will engage a choir girl to sing it and then we might have a recording that gets us to what Mahler really wanted. Two conductors (Bernstein and Nanut) have recorded the work with boy trebles but the results, to me at least, sound bizarre. There is a link to Mahler in Walter's choice of Desi Halban for this recording, by the way. Her mother was none other than Selma Kurz, one of the great stars of Mahler's glittering ten years at the helm of the Vienna Opera at the start of the twentieth century and a particular favourite of Mahler‘s. For this and other reasons this too is an essential recording. Not a reference version, but one to be considered in the same way as the Mengelberg as historic and illuminating. The clear mono sound is better than that of Mengelberg but remains rather boxy and unatmospheric. Another conductor associated with Mahler in his lifetime, though to a lesser extent, is Otto Klemperer. There are a number of "live" Klemperer recordings of this work available but my advice is to stay with the studio recording (EMI 7243 5 67035 2 0) which dates from 1962 and is the first of the modern stereo recordings for us to consider especially now it has been remastered for the Klemperer Edition. This recording is frequently overlooked by surveys of this work and I think that's a pity because it has a lot going for it, not least Klemperer's mordant wit, structural integrity and superb ear for detail. It's certainly superbly played and recorded with Walter Legge in the control room and the great Philharmonia Orchestra in front of the microphones. The first movement is a lot statelier than under Walter or Mengelberg. In fact, it's on the fringes of being underpowered. But there are gains in the much clearer detailing of textures and parts, notably the woodwinds, always a fingerprint of Klemperer. Not for him the excessive indulgence of Mengelberg, or the softer grain of Walter, however. For Klemperer everything is clearly presented in bold, Breughel-like primary colours. The crisis on the dissonance emerges superbly from the structure, always a strong point in a Klemperer account, bold and grand. So too does the "big tone" Mahler asks for in the climax that follows. True, he misses some of the sourness, some of the filigree lightness too, but overall the distinctive playing is a joy. If the tempo seems a little under-paced in the first movement in the second it seems right where Klemperer's primary-colour sound palette again pays off along with our first real experience Klemperer's divided violins, left and right. There's no lingering for effect in the Trios but that's in keeping with the astringent approach, allied to superbly balanced recording. It's in the third movement the biggest surprise awaits us. Klemperer was capable of confounding critics as the supposed master of slow tempo and this is no more in evidence than here where he gives the quickest account of the slow movement of many I know. It alters the character of the piece and promotes this recording to one of even greater interest than it might have been, offering an alternative to the, under lesser men, often comatose accounts we can encounter. Sometimes Mahler would speak of this movement as an Adagio, sometimes Andante and this used to annoy his friend Natalie Bauer-Lechner so he told her he could just as well call it Moderato, Allegro or Presto "for it includes all of these." Klemperer has his justification. I also want to draw attention to the playing of woodwind against strings in this movement as it's like having the score in front of you, so clear is the balancing. 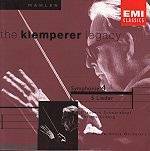 Overall I think Klemperer gives a more unsettled view of the movement than most and for that reason this recording has a special place in the list. Notice too how well he manages the increases in tempo between bars 222 and 282: an acid test for the conductor in this work. Then the moment of climax, when Mahler depicts the flinging open of the gates of heaven, timpani hammering out the bell-like motif hitherto heard quietly on harp and reminiscent of the bells in Wagner's Parsifal, really bursts with joy and is played for everything. It's a fine preparation for the last movement where we come to the most controversial part of this recording, the reason why many people dislike it so much. Singing in the fourth movement is no less than the great Elisabeth Schwarzkopf and it's clear from her first entry her approach is wrong for this music. That she is far too worldly, far too knowing, far too "arch" for what the strange and simple words and music need is obvious. And yet, for all that, she does it all so beautifully, even though I always shake my head when I hear her. And smile too. 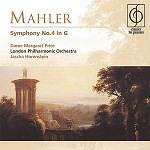 The Klemperer recording wasn't the first Mahler Fourth by the Philharmonia Orchestra of the old era with Walter Legge producing. As early as 1957 Paul Kletzki had made a version which Legge must have felt was going to be hard to equal, even with Klemperer (Royal Classics ROY6468). This must be at the top of the list for bargain hunters as well as a contender irrespective of price. It has always been a favourite of mine and I've always felt it has been overlooked because Kletzki is not a conductor usually associated with Mahler and was never one of the big names. He does superbly well and is supported by an orchestra which, at the time, was at the height of its considerable power. Some would say their response is not Mahlerian enough and I suppose I can see what they mean, but the gains they bring to their account are remarkable and, like the Concertgebouw of 1939, bring us a style of playing now lost. Straight away there is more lift to the first movement than with Klemperer, more bounce and optimism to aid the jocund woodwind - "Legge's Royal Flush", as they were known. Kletzki seems determined to press forward, accentuating a more spiky feel, less likely to lay back and contemplate. In the development this is even more in evidence where the principal horn of Dennis Brain makes a wonderful impression. More details beguile us including the shrieking clarinets as the point of crisis approaches. I think this recording has an almost ideal sound balance for home listening with every detail clear. Though a little age is betrayed by a touch of harshness at the climax even though I loved the tam-tam being allowed full rein. This is followed by a remarkable similarity between the textures of this section and the music of the Third Symphony's third movement, something no other conductor but Kletzki seems to have noticed. An illuminating touch from the conductor, but I think Kletzki draws more out of the textures of this movement generally than Klemperer and can't help but wonder whether Legge realised this. There is a rather veiled quality to Kletzki's account of the second movement which is quite appropriate and refreshing. This isn't at the expense of important details since you can hear the clarinet really chuckling, showing us Kletzki is well aware of the humour in the music that is so often forgotten in the "It's Mahler so it must be depressing or ironic" school of thought. The more inner quality is apparent in the slow movement which emerges as deeply felt and noble with a hint of tragedy. Kletzki’s soprano is Emmy Loose who seems far better suited to this symphony than does Elizabeth Schwarzkopf bringing a more child-like and wide-eyed approach that is more appropriate. Leopold Ludwig will be fondly remembered by Mahlerites of a certain age for a recording of the Ninth Symphony with the London Symphony Orchestra that achieved wide circulation in the 1960s, first through Everest and then through the much-missed World Record Club. Coupled with Rudolf Schwarz’s recording of the Fifth Symphony on the latter label it served us very well when there was little else available. His recording of the Fourth (Berlin Classics BC 2119-6) was made in Dresden in 1957, not long after the Kletzki, and has appeared sporadically over the years. In 1957 Mahler’s music was still quite rare in the concert hall and these Dresden players especially must have approached the work as something of a novelty. Maybe this partly accounts for the fact that this is a very straightforward, supremely unmannered performance compared with many other versions – an antidote to those who take the view that every expressive opportunity in Mahler’s scores must be attended to as though under a magnifying glass, perhaps. But that can’t be the only explanation. Leopold Ludwig was a fine conductor with a high reputation and must have decided his own approach from the start. Though I still cannot help wondering whether he felt he couldn’t really test the players as much as he may have liked in music they hardly knew. More experienced Mahler listeners may be disappointed with the "hands-off" approach that emerges. But there are still some dividends to be had from this recording, especially when the orchestra concerned is one of the greatest that, even in late 1950s East Germany, had clearly maintained standards through hard times. In fact it’s interesting today to hear a performance taking Mahler at apparent face value in the first movement. Mahler does appear to have written something that implies sunshine and that is certainly what you get from Ludwig. It’s almost as if he is determined to tell us there are absolutely no clouds and no storms on this horizon. The brisk tempo he sets and keeps, one probably closer to what Mahler intended than we may now be used to, helps. This is very much a feeling that is continued in the second movement too. Other recordings will offer you more edge to the "Friend Death" off-key solo violin passages, as well as greater character to the woodwind textures, but what we have in this movement is very much in keeping with what has gone before and what will come – plain, unadorned, uncomplicated playing. It was only in the third movement that I felt the lack of any personal involvement most strongly. Again the tempo is kept moving along and whilst there is still warmth and consolation to be felt it is only the fine phrasing of the Dresden strings that prevents this wonderful music leaving us feeling short-changed. The movement doesn’t really linger in the mind as it can. Then in the last movement there is a little hesitancy in the delivery of the bursts of reprise from the first movement that punctuates the Wunderhorn setting. The only tangible impression of unfamiliarity with this music on the part of the players, I feel. Almost as if the music takes them by surprise. Anny Schlemm is no more than an adequate soloist and certainly doesn’t manage to deliver the heart’s ease that other sopranos can at the very close. Unfamiliarity with the genre again, perhaps? Mahler’s Wunderhorn settings are a very particular mix of humour and fantasy which it has taken a generation for singers and players to really master. However, this is an interesting recording from an era prior to the Mahler boom and from behind the Iron Curtain. Benjamin Britten's admiration for Mahler went back long before the "boom" of the early sixties and in his notes to the BBC Legends issue (BBCB 8004-2) containing Britten's 1961 Aldeburgh Festival performance of the Fourth Donald Mitchell identifies his friend as one of the leading figures in the early renaissance of Mahler's music. This BBC mono recording with the LSO in Orford Church has a rich, deep sound with some church reverberation but no distortion to playing which breathes humanity and involvement. 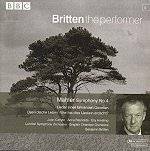 In 1963 Britten talked about this performance to an interviewer and said: "My experience of conducting the Fourth Symphony at Aldeburgh showed me what a master of form he (Mahler) is, particularly in the first movement of that great work." These thoughts seem to partly explain the decision for his very brisk tempo in this movement. The effect from the start and throughout is of lightness and optimism, classical tautness rather than romantic weight, and I think this suit’s the character of the music well. One of the sounds one takes away from this recording is the attention Britten pays to articulating the lower strings, helped by the acoustic. At the close of the Exposition there are some lovely slides, as idiomatic a Mahler sound as you could hope for, and this also applies to the spicy woodwinds at the start of the Development where Britten injects a more dramatic cloak to the proceedings. The "climax on the dissonance" is well observed but not to the extent that it protrudes and holds up the sense of momentum the structural/formal approach has brought. It's a delicate balance this "form versus detail" dichotomy. Though Britten clearly veers to the former he seems well aware enough of the latter pulling him back since, in the closing section, his ability to bring out points of detail without diminishing the sharp focus shows that a conductor doesn't really need to slow up and "ham up" in order to seduce the ears of the listener. By not lingering over the Trios in the second movement Britten keeps momentum up here too. I must also draw attention to the deliciously played violin solos which make their out-of-tune effect without appearing too ill-mannered. There is some superb solo horn playing also. The performance of this movement comes out on the side of the angels to come rather than the Devil, whose violinist Death dances around us but never really threatens. If freshness and classical rigour seemed the keynote in the first and second movements it's clear Britten reserves the true emotional heart for the third in an interpretation which is one of the finest I have ever heard. Listen to the meticulous care for dynamics, both in the string parts and the woodwind solos, and the flinging open of the gates of heaven is big, powerful and warm also. It sounds perfectly integrated with the rest of the movement. Barry Tuckwell's horn section are resplendent over timps that are admirably reined back for a change too. Sometimes the final song can sound as though it's been tacked on as an afterthought. Under Britten and his care for through-thinking there is no question that he accepts Mahler's decision to end like this and is able to make it sound a natural progression. Again he is quick and pungent with some sharp interruptions and is aided by his lively soprano, Joan Carlyle, who has a Tomboy quality to her: a Cherubino rather than a Susanna. At the same time as the release of the Britten recording, BBC Legends also gave an official release to one by Sir John Barbirolli and the BBC Symphony Orchestra made in Prague in 1967. (BBCL 4014-2). Although Barbirolli was of the "interventionist" school of Mahler conductors his brand of expressionism never sprang from self indulgence. Michael Kennedy found a quotation from Russell in the conductor's papers: "....underneath the passion there should always be that large impersonal survey which sets limits to actions that our passions inspire." There is about his reading of the Fourth a remarkable air of calculation underpinning the emotion that throws a frame around what, under other conductors, might sound like hamming. The feeling that thought and careful planning has gone into every bar and every sound too as this is a recording where the sound of this symphony has been rendered to a more vivid degree than I have heard in a long time. You could also say this is Mahler's Fourth in retrospect from later works. Barbirolli doesn't at all indulge in the excesses of Mengelberg, but he's closer to the Dutchman than many. In the tapes made by William Malloch of the old New York players who played under Mahler himself we hear how the composer would interpret the opening theme of this movement and it's as if Barbirolli had heard this too for in the fourth note you hear the same drag that with Mengelberg is so accentuated it can annoy on rehearing whereas under Barbirolli it has the effect of a rather arch "Once upon a time" and is quite charming. 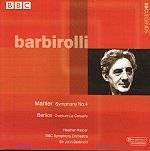 Likewise his rendering of the second theme marked "Broadly sung" where Barbirolli really takes Mahler at his word. But that appears to be the hallmark for the strings, the cellos especially, in this performance. 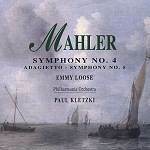 One of the other glories of this recording is the prominence given to woodwinds with some particular phrasing in the oboes and the sound of the bassoon against high flutes in the development especially notable - reminder of Mahler's propensity to pitch highest and lowest against each other that would reach its apogee in the last movement of the Ninth. In sum, I think Barbirolli sees this movement's darker, unhinged side more than most. The pizzicatos and spiky high woodwinds really protrude from the texture. In the second movement I liked the woodwind chuckling in the Trios and the clarinet shrieking like a startled bird. In performance Sir John always positioned his harps at the front of the platform beneath him and this may account for the prominence of the harps in the performance as a whole. The way it underpins the texture bell-like is another memorable sound to come out of this recording, again apparent in the third movement which receives a performance in the grand manner, spacious, well-upholstered, broadly sung, but also consciously moulded with the most elastic approach to tempo in the whole symphony. There are many fine points of detail brought out. Most notable are passages for the woodwind that take on an autumnal colouring. Just before the passage where the gates of heaven are flung open Sir John achieves a real sense of stillness akin to that at the end of the Ninth which makes the outburst that crowns the movement that much more towering. I want to pay special tribute to the coda under Sir John. He sees a perfumed garden, exotic and hazy, and I couldn't help but see Mahler here as a distant musical cousin of Frederick Delius. The last movement is a relative disappointment, though. Heather Harper has the wrong kind of voice for this movement. She is too matronly for the childish quality needed. Barbirolli also does himself no favours by adopting a slow tempo for the stanzas and an even slower one for the final stanza of all. The effect is a bit dreamy most of the time, broken only by the sudden jolt of his quicker tempo for the incursions of the bells. It would be wrong to let this reservation spoil what is a remarkable, if very individual, reading of the work which has needed to be restored officially to the catalogue for years. Rafael Kubelik's recording with the Bavarian Radio Symphony Orchestra can be found singly on a Deutsche Gramophon Eloquence release (469 6372), otherwise it's in the boxed set of his complete cycle. As always Kubelik's tempi are on the quicker side compared with others, but this is never at the expense of inner detail, quite the opposite in fact. Early in the first movement notice the solo clarinet chugging away around the strings and listen also to how Kubelik sours the music in the Development. He has a great line in the grotesque with the bassoon especially memorable and, as the central crisis approaches, notice too the squeals of flutes and oboes. In fact at this point Kubelik is perhaps the most harsh and most abrasive of all. Kubelik is another conductor who realises this symphony needs a particular treatment, a light touch in front of the grotesques for them to make a more distinctive mark. The climax on the dissonance is superb with the bass line especially accentuated by the sharp recording against the piquant woodwind. Then, when the music resumes, the effect is like that of a day dream passing, which seems to me to be what Mahler intended. The second movement follows on from the kind of mood Kubelik is trying to portray in the first with the solo violin balanced forward to make its "out of tune" effect well. Then the Trios strike a very four-square pose with clipped woodwind contributions attended to in a performance that radiates attention to detail right down to really malevolent clarinets at the close. A fine prelude to the lovely performance of the slow movement where Kubelik maintains the same kind of singing line as Walter. He even brings in the movement at around the same overall timing as Klemperer but by speeding up more in the faster sections gives himself that little more space in the lyrical passages. So his handling of the surprisingly many tempo changes, some of them quite drastic, in a movement too often referred to as the "slow" movement is one of its most remarkable features. Not least the passage between 222 and 282 we noticed under Klemperer where Kubelik is even more convincing in handling the step-by-step increase in tempo. I also want to draw attention to the way Kubelik treats the sound of woodwind against strings in this movement and how they are reproduced in the recording. One early commentator dubbed this delicate sound "Klangfarbenmelodie" ("Tone-colour Melody"), a term used later by Schoenberg and that link between these two great Viennese composers never seemed more significant in these passages as interpreted by Kubelik. Again the soprano in this work, Elsie Morrison, fails to really deliver a childlike response in the last movement, but she sings with great meaning and Kubelik seems more anxious than most to mark the relationship between aspects of this last movement and the second. The faster sections also are very impish and the work is rounded of beautifully. One brief sidelight on Kubelik's recording which I leave you to ponder is the following. 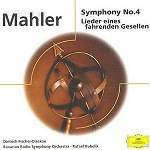 In 1900 Mahler told Natalie Bauer-Lechner that the Fourth Symphony would last forty-five minutes, which is a surprisingly short amount of time when you consider most recordings and performances. But notated in pencil in the autograph score, on the title page of the fourth movement, can be seen the numbers 15, 10, 11, 8 and 44 which is their total. Do these represent Mahler's ideas for the duration of the movements ? If so they are very quick, much quicker than we are used to. Of all the recordings before me Rafael Kubelik's comes closest: 15:48, 9:05, 18:50, 7:58, which total 51:41. The third movement is the problem, but since Kubelik is one of the two fastest, a few seconds only short of Klemperer, we can allow for that if we accept the figures for what they appear to be. Whatever the truth, for me Kubelik's recording is one of the supreme accounts of this work. It's care for detail, its sense of the special sound of the piece, but above all its care for this work as it stands rather than as precursor of what is to come make it a must for all aspiring and established Mahlerites. It lets the symphony be itself. Following concert performances in October 1970, Jascha Horenstein went into Barking Town Hall in London with the London Philharmonic to record the Fourth (in between bursts from pneumatic drills doing road works in the street outside). This was to be one of the first recordings for the new Classics For Pleasure bargain LP label and the result was musically deeply satisfying even though the sound on the LP left a lot to be desired. For what ever reason, the recording failed to sell very well so was never really considered among the recommended versions in the way others have been down the years. Then for a long time it was out of the catalogue leading many to be unaware of its existence until a fine remastering job was done for an LP reissue by CFP in the 1980s. Now that remastering has been reissued for CD (5 74882 2) and it can more than hold up its head among the greats at last. Horenstein's first movement starts out a degree more distanced than Kubelik's, less distinctive, but just as aware of the work's special tone colouring. Compared with Kubelik, Horenstein is more "through-thought" and symphonic, preferring a slightly tighter rein on proceedings. So this is not a performance in the Mengelberg tradition. Horenstein was a different kind of conductor even though he admired the Dutchman. Even so, this is Horenstein more unbuttoned than we are perhaps used to, showing what anyone who has ever heard his recordings of Viennese Waltzes knows that he can charm and beguile with the best of them. Listen to the way he gets his cellos to slide if you want more convincing, for example. In the Development a slight hesitancy pays off in introducing a degree of trepidation. As if, master of the developing argument that he was, Horenstein makes us aware that the one true crisis in this work is casting a very long shadow back. His slower tempo, judged to near perfection, allow for the ghosts to peek out from the filigree with real drama and the climax itself to be grand and imposing. So the first movement under Horenstein is remarkable for its structural integrity, breadth, but also charm, delicacy and feelings of menace. Again in the second movement Horenstein is that bit more distanced from the music than Kubelik and some others - his woodwind not quite as prominent and his tempo just that little broader - but this approach is not to be discounted. By keeping a degree of distance Horenstein seems to accentuate the dream-like quality. His clarinets chuckle wonderfully and there is a trace of elegy in the Trios Kubelik misses rather. More nostalgia with Horenstein, I think. I also like the way the music seems to be fading into the distance as the movement draws to a close. It is as if we are walking away from the scene. As you would expect, Horenstein hardly intervenes in the phrasing of the slow movement. If he does it's the lightest of hands on the rudder. As so often, he chooses at the outset a tempo that suits the music and let's it speak for itself. However, such simplicity of utterance is also strength of utterance for what we have is more towards the repose Mahler is asking for, I believe. There is at the start a cool beauty that refreshes. This more cerebral/ intellectual approach needs time and repeated hearings to make its effect, but those passages of greater drama, of pain and yearning grow from this sustained opening and gain from the comparison. After this, Margaret Price is a very creamy-toned soprano who pouts a little too much for my liking. But she's as good in this as most sopranos and her contribution rounds off as performance I cannot recommend too highly especially at the super-bargain price. It is, as with Horenstein’s recordings of Mahler’s Third, one of the finest Mahler performances ever committed to tape. The sound is showing its age when compared with the best of the most recent but the performance more than compensates. George Szell and Fritz Reiner had much in common. They were both born in Hungary, both enjoyed success in post-war America, both led two of the greatest of American orchestras, and both had a reputation for their authoritarian styles. And they both left us great recordings of Mahler's Fourth. 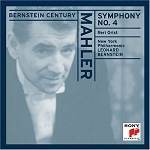 The Szell recording with the Cleveland Orchestra (Sony SBK 46535) has never been out of the catalogue since its release in the 1960s and such is its reputation it's traditional for Mahlerians to genuflect at the flame every time discussion of the Fourth comes up. One almost has the feeling that criticism of it is not to be countenanced under any circumstances. The first movement presents a nicely median tempo with some magical playing from an orchestra that was, at the time, arguably the finest in the world. There is great poise and refinement too, but maybe a degree of polish that means we cannot penetrate quite as deep beneath the surface as we would like. Szell's concentration on refinement has always rather blunted the first movement climax for me and always seems to confirm that, great though this recording certainly is, it's an example of what might best be described as "controlled risk" conducting. The feeling that Szell is prepared to go so far with character and expression but not too far that perfection of playing are compromised even the cost of the music's deeper meaning. Consider the recording alone and this is not a problem. I know many who swear by this recording. But I have to report that in close comparison with those already dealt with I find myself yearning for more depth. In the second movement there is again a wonderful attention to tonal beauty but I wonder whether Szell is really aware of what the music really means, or whether he is just giving a very good impression that he does. No praise can be too high for that playing, though. Myron Bloom's horn is magnificent. But the sourness and grotesques written into the woodwind, which Kubelik and Horenstein and others bring out to a greater degree, don't make as great a point. Certainly Szell's account of the slow movement is deeply moving. I am aware many will find my slightly negative feelings towards the Szell recording disappointing, shocking even, but I would not be honest if I didn't report them. The recording should have, and fully deserves, its place among the greatest and that is why I mention it here and by doing so recommend it to you. It's just that I think others penetrate the piece more than Szell does. One authority once went on record as saying he believed Szell to be "no Mahlerian". I have heard "live" recordings of Szell in Mahler's Sixth, Ninth and Das Lied Von der Erde, and count them among the best I have ever heard. His Mahler repertoire was small but so was Klemperer's. Fritz Reiner also exercises great control over his orchestra, the Chicago Symphony, and even more on the music. (RCA 82876679012[SACD] or 09026640022). Where George Szell's emphasis was on beauty of tone, Reiner's is on clarity. There are gains here in that you are aware to a remarkable degree of the texture of the piece, but there is a brittle quality to it that can be rather wearing on repeated listening. Like the Szell recording this has a rightful place in the pantheon of Fourth recordings, but what is missing here is that sense of repose that is so important especially in passages of nostalgic reverie. Reiner can bring out the grotesques, but there is less context for them, less ability for us to reflect on what they mean to us, because we have little with which to compare them. It's a very sharp ride then, but one that should be experienced by those interested in how this symphony ticks and in hearing a great conductor and orchestra again at the height of their powers. Also from the USA of the same period comes Leonard Bernstein’s first recording of this symphony with the New York Philharmonic. It was made in 1960 though it would be 1971 before it was released in Europe. As a statement of intent, if that is the way it was perceived at the time, it must have struck American collectors as quite a style change from this orchestra’s previous recording of the work under Walter. The first movement is sassy and sharp in its pointing up of every small detail, woodwinds especially cheeky, and is a sparky realisation of Mahler’s happiest music. Though I think the development section is a shade too fast I can compliment the NYPO for holding on so well. This does betray what sounds like impatience on Bernstein’s part though I’m sure that is not what he meant. The second movement is equally colourful and helped by a sound balance that is exemplary for home listening with only the top edge betraying age. The third movement starts serene and becomes volatile but only occasionally strays beyond the tasteful and full marks to Bernstein for the snappy tempo he adopts in the last movement. That must have sounded more controversial then than it does now. Reri Grist has a distinctive enough timbre but I cannot escape the impression that she doesn’t really know what she is singing about. At least she is a woman. In his second recording of the work on DG Bernstein casts a boy treble in the last movement which I think rules it out completely. Had Mahler wanted a boy to sing the last movement I am willing to believe he would have said so in the score. My choices for recordings of this work so far have come from at least thirty years ago but it would be wrong to think that in the case of this symphony as opposed to the Third only "the old boys" have it. Far from it. There are still new things being said by the present generation of conductors in this work. 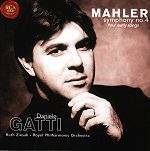 Daniele Gatti's recording is a case in point. He is forging a well-deserved reputation as a Mahler interpreter and there is room in a very crowded list for his Fourth Symphony with the Royal Philharmonic Orchestra on RCA (75605 51345 2). His grasp of the many-faceted nature of this work is impressive. Though some of his extremes of tempi, some of them from bar to bar, might bother those more experienced Mahlerites whose predilection is for the hands-off approach. I think Gatti comes out of the tradition of Mengelberg and Barbirolli in this work, controlling and interpreting every bar and note. There is no doubt he submits the first movement to a very deep analysis with the slower, reflective passages lovingly and warmly conveyed and the sharper, quicker ones very jerky and piquant, not missing the grotesqueries that lie beneath the surface of a work too often seen as light and amiable. This central idea of the symphony having two distinct faces - reflection contrasted with restlessness - continues in the second movement where the Trios have even more moulded contours than their counterparts in the first and border on the mannered. But they are delivered with such style and aplomb you cannot help smiling at their returns. There is humour in the mix of this movement and it's surprising how few conductors realise this and bring it out. At times you even have the impression Gatti is sending the piece up here. The "out-of-tune" violin solo has never sounded more sinister either and a special word of praise is due to the principal horn. In the slow movement there is much intensity in the hushed pianissimos that is swept away by a remarkably muscular attack in the climaxes. After all of asset, even at the extremes of tempi that her conductor maintains, bells jangling. The playing of the Royal Philharmonic Orchestra is exemplary in all departments with some spiky woodwind well caught by the spacious but sharp sound, especially in the fourth movement where Gatti doesn't forget the animals that are being depicted in the accompaniment. The recording of the Fourth by Pierre Boulez and the Cleveland Orchestra on DG (463 275-2) will divide opinions just as the others in his cycle have. Ever the clear-eyed interpreter of Mahler, Boulez barely acknowledges the availability in the score of the many expressive opportunities other conductors use to the full. At the fourth bar of the first movement, for example, where others have been known to almost bring proceedings to a halt, Boulez’s mere Gallic shrug in the direction of Mahler’s marking (and the performance tradition) itself stands out. An expressive opportunity more conspicuous in the breach rather than the observance, I think. This general attitude will be one of this recording’s most obvious fingerprints as the same sharpness of focus continues through the first movement where a brisk, clear, neo-classical effect is aimed for and achieved. This impression is assisted by a care for balancing every section of the orchestra so nothing protrudes to rock the boat. To some this will be evidence of coldness, to others it will be a refreshing "back to basics" that takes us further into the origins of this work as representative of Mahler’s "Wunderhorn" period. Not least with the trumpet figure Mahler called the "Kleiner Appel" and later recalled at the start of his Fifth Symphony. Here this crucial appearance, half way through the movement, is buried by Boulez within the texture rather than trying to override it which it sometimes does in other versions where conductors try to make a link to a work Mahler had not even considered when he wrote this one. Then the second movement continues Boulez’s general approach but deepens the music with superb woodwind solos from the Cleveland players caught by the fine recorded balance. What we hear in the third movement is remarkable for its lack of pretension and its greater stress on classical poise. I was even reminded of the slow movement of the Schubert String Quintet at the start, so fine is Boulez’s sense of stillness achieved without an especially slow overall tempo. In the first main variation notice too the balance of oboe against horn and then the surprisingly expressive quality that emerges chaste on the strings. Another point to listen out for is how the timpani are never in danger of overwhelming the more passionate, climactic passages. So Boulez’s watchwords of "balance", "poise" and "transparency" really reveal details others can miss. The aftermath of the central climax of the slow movement, where the gates of heaven are flung open by Mahler, is especially fine in this respect and also structurally accentuates the arc-like design of the movement. Juliane Banse sings beautifully in the last movement, making no attempt to impose herself too much as some singers make the mistake of doing. Of course some will say she should sound more child-like, just as Mahler intended, but she’s not alone in concentrating on the notes and words and I was delighted by her contribution as it’s beautifully tailored to the rest of the performance which is, after all, as it should be. For many this new recording will be just too clear-eyed, too lacking in character, too tidy a performance of this lovely work. For me it represents Boulez’s Mahler at its very best and does, in the end, show a certain degree of warmth that’s crucially tempered by that classical poise to give another refreshing view of a work we might think we are all too familiar with. By some strange alchemy Benjamin Zander has managed to vividly convey the last movement as the real culmination of the Fourth, the homecoming for the whole work and it is that that in the final analysis makes his recording with the Philharmonia (Telarc 2CD-80555) a satisfying one. Indeed I have heard other recordings where, in comparison to this one, it is almost as if the conductor is rather embarrassed by such an apparently trite ending to such a spacious work, especially following one of the greatest and most profound movements Mahler ever wrote. As always with Mahler there is profundity to be found in the most unlikely places and juxtapositions and it takes a conductor who knows his Mahler to bring this out. His soprano soloist, Camilla Tilling, is charming too. Far more the "tomboy" than many of her colleagues and her contribution undoubtedly assists Zander in marking the performance of this movement out as distinctive. Something which might not have been the case with a more established diva. As if to further prove he has thought very deeply about how this movement should be presented, in his discussion disc Zander plays an extract from a concert performance of the work he conducted in Vienna where he used a boy soprano for the movement. This has been done a couple of times on record (by Nanut and Bernstein in his second recording on DG) but I have never been in favour of it. Not least for the fact that Mahler asks for a soprano and not a treble. So I’m glad Zander resisted the temptation to cast a boy in the recording, as it must have crossed his mind to do. In the first movement Zander appears suspended on the cusp between neo-classical restraint and zeal to deliver surface lustre. It certainly seems as though he is wary of crumbling the music’s petals so the movement emerges in a rather patrician fashion: all symphonic and score details attended to but lacking degrees of fallibility. I don’t think he is helped by the recorded sound that I find a little too general and bass light to make a great impact and deliver the music’s character. Contrast this with the Kletzki recording, for example. Even after all these years this is still an object lesson in how to balance this work with bags of detail in perfect proportion. The second movement is more persuasive in both cases with Zander, though. Here he and his violin soloist, Christopher Warren-Green, really have gone to some trouble to project the particular fairy tale evil lurking behind "Friend Death". I liked too the character-filled chuckling of the clarinets and the effortless way the music segues into the Upper Austrian trios. You can almost see the orchestra members, exemplary throughout, smiling at those points. In the discussion disc Zander makes the inspired connection between the solo fiddling in this movement and that in Stravinsky’s "A Soldier’s Tale" which was, let us remember, just eighteen years away when Mahler completed this symphony. There’s a thought. I always find connections like that send me back to the music with new ears and that, as always, is the great value of the discussion disc which I suggest you listen to after you have heard the symphony. The great slow movement receives a luminous, seamless performance from Zander and the orchestra with great line that just fails to penetrate beneath the surface beauty. Here I see Zander as a collector and connoisseur of Dresden china who has taken down a much-loved piece from his shelf that he knows every inch of and wants you to know every inch of too and come to love just as much as he does. As fine a guide to the movement than you could ask for but, as with the first movement, he is rather afraid of dropping his much loved ornament and smashing it to bits. The patrician again. Don’t get me wrong. I like patricians, even in Mahler. There is a certain streak of the patrician in Jascha Horenstein and I admire his Mahler conducting above most. But I do wonder whether, over time, the extreme care Zander takes over the first three movements will mean that this recording won’t endure, won’t really endear itself to the listener in the way others have. Certainly in the great "collapse climaxes" in the centre of the slow movement the music opens out wonderfully, the great vistas as impressive as ever, and the gates of heaven burst with a real surge of energy. It is then that the last movement enters and is able to make the effect I so much admire. For that aspect above all this version earns its place in the discography. If Donald Rumsfeld were a Mahlerite he would hate the recording of the Fourth by Michael Tilson Thomas and the San Francisco Symphony (SFSO Media/Avie 82193600042, an SACD release). The third movement had barely been underway two minutes when I had written in my notes "Old Europe" which is something of a bête noire for Mr. R. It’s all in the strings. Especially in the third movement there is a marked degree of portamenti or sliding between the notes in phrases that you associate with a recording made over sixty years ago. I’m not complaining. Quite the opposite. Don’t think that what you are going to hear will distract you or grate in any way as this practice can when taken to the extreme. Tilson Thomas has asked for and been given by his string players just enough of that "old world" phrasing to make this movement a really moving and distinctive experience getting right to the warm heart of the movement and therefore the symphony and bringing memories of Walter and Mengelberg flooding back. It’s a fine achievement and a welcome antidote to some of the squeaky-clean, machine-tooled Mahler recordings heard so often. The overall tempo for the movement is slow, slower than many, but never drags. Momentum never flags, such is the attention to detail, to springing the underlying rhythms and the marking of the nodal points. Though you would never know it, this CD is the result of "live" performances so perhaps the experience of performing the movement in one go is paying dividends. Tilson Thomas delineates so well the two aspects of Mahler’s "once upon a time" world making up the first movement’s symphonic argument. Mahler was probably describing in music his own bright-sky exhilaration at arriving as the conquering hero in Vienna. However he uses a spiky, unsettled development of the exposition’s more dreamy and laid-back material to vary the course of the movement. Tilson Thomas grasps this aspect admirably. The ability to "read" a movement’s topography in this way is so often the sign of a fine Mahler conductor. There is a sense of contented repose to be found in the exposition and then a full exploitation of the orchestra’s fine woodwind and brass players to spice up the development. These players are heard to excellent effect in what is a superb sound balance. All comes to a perfectly judged resolution at the climax of the development where the emergence of the trumpet solo, prefiguring the opening of the Fifth Symphony, makes its mark. Tilson Thomas and his engineers are careful not to let this trumpet moment protrude too much. In the later stages the string phrasing, the "old world" slides that will become so much a part of the third movement, make their first real appearance and are deeply satisfying. The second movement accentuates the mood of the first’s development with great scope given to the weird violin solo and the cluckings of the woodwind players who are again heard to fine effect in the recording. The third movement stresses the contemplative side of the symphony. All that is then needed to complete the story is an adroit performance of the final movement to bring it all to final rest. So much depends on the delivery of the soprano soloist who must give a child’s view of heaven and so must sound young. I am too much of a gentleman to ask Laura Claycomb’s age but I think I can safely say she fits the bill admirably, as does her feisty "daddy’s girl" delivery. For his part Tilson Thomas drives the sleigh bell interludes with a terrific snap. 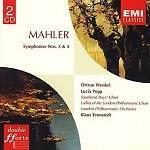 In this he keeps in our minds, right to the end, the bipolar element that exists in even this most amiable of Mahler’s symphonies. The playing of the San Francisco Symphony Orchestra is exemplary throughout and the recording rich and detailed. There have been so many fine recordings of this work over the years that there are many that can be recommended to collectors to last them a lifetime. This latest one is certainly now among them. If you have room for another Fourth that is well-recorded and well played, and with that striking sense of "old Europe" in the third movement, this is certainly one to consider seriously in a crowded field. Just don’t send a copy to the Pentagon. Tilson Thomas’s gives us a Fourth from the grand tradition and one of the most recommendable now before us. 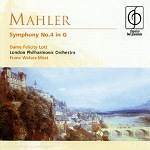 Symphony tends towards the former category and this is in keeping with his approach to Mahler generally which always tends to the dramatic, the romantic and, in some cases, the mannered. Maybe it's the special nature of the Fourth but not even Segerstam, some of whose Mahlerian excesses I have found unacceptable, can spoil the work and prevent him delivering a recording with much appeal, though it could not be called "mainstream" like those by Kletzki, Szell, Horenstein or Kubelik are. Segerstam falls more into the kind of subjective interpretation represented by Mengelberg or Barbirolli but with the extra advantage of superb playing and recording, even though the latter may strike some as being too large-scale to suit what is a more intimate work. The slow third movement is best representative of the kind of interpretation Segerstam seems to be offering. The approach is deeply expressive and the effect deeply tragic: worlds away from the Schubert-like poise of Boulez on DG or the ice- crystal purity of Reiner on RCA, for example. In fact I think Segerstam looks to what would for Mahler be more recent times as he puts me in mind of the hot house atmosphere of Wagner's Wesendonk Lieder with its dark colours and long, sensuous lines. Never was Beecham's remark about this work of Mahler's as "the illegitimate offspring of Tristan and Isolde" more apt. We should have been alerted to the approach Segerstam would adopt in the third movement from his account of the second. His "hands-on" approach allows him to accentuate weirdness in the Trios that ought to have more parody about them. He probably takes this movement too much at face value where Mahler has something subtler in mind - a cartoon world of fairy tale fears in his portrayal of "Friend Death" striking up on his out-of-tune fiddle. In the first movement Segerstam also invests every bar with special attention and this brings some nice touches, like the lower woodwind chuckling away in the Development. But some may find his close attention to detail here ultimately gets in the way of the broader flow. It only remains to report that Eva Johansson is a rather anonymous soprano in the last movement though Segerstam's accompaniment of her is exemplary. An expressive, consciously moulded performance resonantly recorded and sonorously played. Some of Mahler's lightness of touch is sacrificed but Segerstam's involvement offers a persuasive alternative to more central views. Klaus Tennstedt’s fine reading of the Fourth with the London Philharmonic on EMI (EMI 5 74296 2) is coupled with his Third which I included in my survey of that work. With such a large work as the Third taking up most of the two discs it might be the case that the Fourth Symphony is overlooked and this would be a pity. Both the first and second movements see Tennstedt pressing forward in the vigorous passages so that when he relaxes in the more reflective ones he doesn't need to slow down too much to make the kind of contrast he seemed unable to make in the first movement of the Third. It's certainly an impressive and compelling approach. He is also blessed again with excellent playing from the LPO who by then were his to command. They are on their toes throughout for the engineers to capture every detail of their playing and I especially liked the passage between bars 221 and 238 in the first movement where Tennstedt conveys a feeling of spiralling out of control very well. He clearly sees the third movement as one of Mahler's greatest slow movements as he phrases it with a rich depth of tone from the orchestra. Later on his tendency to wear his heart on his sleeve in Mahler intrudes too much but it's always within the bounds of taste and great depth of feeling is conveyed. You can argue for a more detached and analytical approach, less mannered, but you would have to have a heart of stone not to be involved and moved by this. But I think the last movement is far too dark-toned and serious for what Mahler had in mind. Tennstedt has slipped back into his old Third Symphony ways here as he seems determined not to break the mood he has established in the third movement whereas I'm convinced that is exactly what Mahler wants the conductor to do. The playing is superb but too straight-faced to convey any of the fun the words carry. 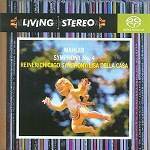 The recordings detailed above are, I think, the most desirable of all to own in their different ways. There are many more recordings, of course. There are fine ones by Lorin Maazel and the Vienna Philharmonic on Sony and Bernard Haitink and the Concertgebouw Orchestra on Philips. Both are superbly played and recorded, both would grace your collection, but neither quite penetrates the work as deeply as the ones already dealt with. I am still surprised at my reaction to the Maazel recording, though. When I began this survey back in 1997 I fully expected to include it among the leading choices then, but hearing it in context with the others disappointed me a little and, on a fine balance, I decided to leave it out and I must say that I haven‘t changed my mind now. But I do want to draw it to your attention again and to some lovely playing and conducting that is contained there (Sony SMK39072). Another recording I want to mention is by Franz Welser-Most and the London Philharmonic on EMI Classics for Pleasure (5734372). This offers a fine performance in the grand and romantic manner at a cheap price. It's ruled out for general recommendation for me by a very slow reading indeed of the third movement. It’s a mind-boggling twenty-five minutes as opposed to just eighteen with Kubelik and is surely far too long no matter how well the London Philharmonic bring it off. Many like this recording just for this reading of the third movement alone. Many like their Mahler excessive anyway, many think Mahler should be excessive at all times. My reply to that is that what excess there is in the music doesn't need adding to by the conductor. Excess is the main problem in Claudio Abbado’s recording with the Berlin Philharmonic on DG but you don’t hear it until the last movement. Abbado’s first recording with the Vienna Philharmonic was never very high in my estimation. I always felt that he was never quite at home with the mixture of fantasy and classicism and never really reconciled them. His new recording is rethought somewhat but to no great effect. The Berlin Philharmonic, as usual, show little corporate Mahler feeling and then in the fourth movement Rene Fleming stands up and ruins everything. If I say that the manner she adopts would have better suited "Daddy Wouldn’t Buy Me a Bow-Wow" I think you will catch my drift. Casting star sopranos in what ever new Mahler Fourth passed through the recording companies seemed to be quite a practice once. It knocked the final nail in the coffin of the, too hyper-sharp, Solti recording in Chicago for Decca when Kiri Te Kanawa arrived and might just as well have been singing the small-ads from "Exchange and Mart" for all the attention she seemed to be paying to the words. Simon Rattle’s EMI recording might well have likewise been spoiled by his soloist Amanda Roocroft, a fine artist but here with her feet in quite the wrong wellies, were it not for the fact that his own mannered delivery of the previous three movements had already done that pretty conclusively. Rattle is no Mengelberg, certainly not in this symphony. In Christoph Von Dohnanyi’s recording with the Cleveland Orchestra on Decca it is the soprano soloist, Dawn Upshaw, who is the highlight. In the rest, as so often is the case, Dohnanyi just fails to get inside the special world of this symphony and certainly comes nowhere near delivering as great a performance as the last time the symphony was recorded in Cleveland by Szell. There is just too much of the routine about it, the slow movement especially, and there is a feeling that the orchestra are not on top form either. That fine and invariably interesting Mahlerian Michael Gielen is not quite at his best in this work either. Strange how this seemingly most simple and "easy" of Mahler’s symphonies can bring even the best conductors to grief. Are they perhaps beguiled by its apparent simplicity? Yoel Levi does much better in his Atlanta Symphony recording on Telarc. He is blessed with superb sound and excellent playing but isn’t he just a little too studied, too careful, too punctilious for his impeccably played and pointed version to add up to anything more than the lightweight and the superficial? We hear lots of detail, but what’s going on beneath? Readers of these surveys will not be surprised to know that the word "superficial" is also one I choose to apply to Riccardo Chailly’s version on Decca with the Concertgebouw Orchestra. He is as well recorded as Levi and his orchestra play even better and with more idiom, the strings particularly fuller, but then stand Chailly and Levi up against Horenstein and Barbirolli, to name just two, and the deficiencies of the two modern conductors are only too obvious. Where is their heart, where is their soul? As always in Mahler, the performance to convince is the one that is the sum of all the parts - those are the ones with the heart and the soul. A consequence of writing surveys like this is the amount of "lobbying" one receives from people anxious that favourite recordings may have been overlooked by me. Maurice Abravanel’s Mahler recordings have come in for their fair share of lobbying and his Fourth in particular has many advocates. Abravanel was a Mahler pioneer but I think today that his Utah orchestra just do not have the class or the Mahler pedigree to match even the worthy Mahlerian he was. Another piece of lobbying I have received since starting these surveys and which refers particularly to the Fourth comes from the existence of an arrangement of the work for fifteen chamber players (including piano!) that was made by Erwin Stein in 1920 for Arnold Schoenberg’s Society For Private Musical Performances. This short-lived organization was dedicated to performing new and under-performed works and as Mahler’s symphonies were still of sufficient novelty at that time the Sixth and Seventh symphonies were presented in two piano arrangements and "Das Lied Von Der Erde" and the Fourth Symphony in reduced chamber versions. 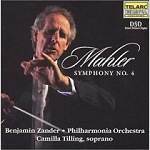 The Fourth would seem a natural for such a treatment as it is the most chamber-like of Mahler’s major works. In the time since the appearance of the first version of this survey a number of recordings of this Stein arrangement have appeared and, if my lobbying is anything to go by, is highly regarded by many people. For myself I see nothing at all to get excited about. Quite the opposite, in fact. No matter how felicitous, no matter how much care, no matter how much integrity Erwin Stein brought to his work in 1920 the fact remains that Mahler’s miraculous scoring is here literally butchered before our ears, rendered down like a prime carcass in a meat factory into something easily chewable for the fast food industry. If Mahler’s Fourth in its finished form is a big juicy turkey fresh from the oven the Erwin Stein chamber arrangement is a plate of underdone Turkey Twizzlers. Not to put too fine a point on it, I loathe it with a passion. I loathe it because I love the original so much, and am at a loss to know why so many people who also love the original can apparently find anything in this abomination to detain them. I suppose it served a purpose at a time when it was not possible to hear in performance what Mahler really wrote. But now we have lots of performances, many recordings and frequent broadcasts so there seems no need for the Stein arrangement other than as a bizarre curio from a bygone age with a sound more suited to a Palm Court tea dance complete with lukewarm tea urns, curling cucumber sandwiches and the distant snap of arthritic hips. If you do still want to hear it after I have just trashed it so enthusiastically (and that means you probably do now) then the fine recording by Douglas Boyd and the Manchester Camerata on Avie (AV 2069)) is the one to have. Not least for the delicious singing of Kate Royal in the last movement and the clear balanced recording all at super bargain price. These players at their full strength would do well to consider performing the real thing as it stands because let us hold the thought of a chamber orchestra in Mahler’s Fourth Symphony a little while longer as I deal with one more recording that I wouldn’t want you to overlook. Playing Mahler’s Fourth as it stands in the finished score but with a chamber sized string section is not as mad an idea as it may at first sound. In his chapter "Mahler’s Kammermusikton" in "The Mahler Companion" Donald Mitchell writes in fascinating detail about two performances of Kindertotenlieder and other songs that Mahler himself mounted in Vienna in the small Brahmssaal in 1902. The orchestra comprised members of the Vienna Philharmonic formed into a chamber orchestra and subsequent research points to an ensemble of approximately thirty-six players, a lot less than we are used to in Mahler’s songs. Research by Renate Hilmar-Voit suggests strings of about 8-10 violins, 6-8 violas, 4-6 cellos and 2-4 basses. (In a 1966 Aldeburgh performance Benjamin Britten gave Kindertotenlieder with 17 violins, 4 violas, 5 cellos and 2 basses and that with no access to any research just his own instincts.) In an earlier chapter in the Mahler Companion, this time specifically about the Fourth Symphony, Mitchell goes further when he writes of Innocence and Experience manifested in this work and pursuing Innocence he cites, among other things, "the shift towards a chamber-orchestra style that Mahler was soon to establish in Kindertotenlieder and the late Ruckert settings, his ‘Kammermusikton’ as he was himself to describe it." (The italics are mine). Then in a footnote Mitchell draws our attention to that very 1902 Brahmssaal concert already mentioned. So why not try performing the Fourth Symphony with such a chamber orchestra? Leave aside the chamber arrangement by Stein completely if small forces only are possible? Well this is largely what Daniel Harding and the Mahler Chamber Orchestra seem to have done in their recording for Virgin Classics (7243 5 45665 2 3). The first movement is crisp and clear with great bounce and optimism with great care given to the dark and light contrasts. The smaller than usual string section really allows the winds to stand out here. In the second movement there is more character and great wit too with the smaller string body again making the detail stand out in sharper relief than we are used to. Some may find the third movement the place where the strings are needed more. That would only really be the case if you are determined to view this movement as a lush, romantic meditation instead of being the product of a more neo-classical sound world. With Harding and his players it emerges with a chaste purity to start with but there is some power too in the later sections. The overall tempo is also very moderate and is sustained superbly. As with the two previous movements the perspectives on the winds are changed profoundly but don’t think there is no power there. But it is often a latent power and the flinging open of the gates could not be more dramatic coming as a real shock. The last movement fits quite naturally and Dorothea Roschmann is a lovely soloist who seems in complete accord with her conductor. An unusual choice to end this survey with, therefore, but one that I think points us in a direction for this work which is novel and worth considering very seriously in the light of Mahler and is ‘Kammermusikton’ and worth considering for the setting of future performing trends. To sum up, Mengelberg’s immortal recording from 1939 remains hors concors, Barbirolli's is in the same category. Following these I would not want to be without Horenstein, Kubelik and Kletzki from the past generation, and Gatti, Boulez and Tilson Thomas from the present. The Tilson Thomas recording is, I think, a truly great version and certainly the best all round for performance and recorded sound together. Benjamin Britten is on hand for the profound insight of a fellow composer and Daniel Harding for a new insight that, in fact, may not be new at all but which, as I have tried to indicate, might take us back in time to some of Mahler’s own thinking about how his orchestra can sound; a challenge to how we listen to this work and I, for one, am always up for a challenge in Mahler. With which thought, albeit a tentative one, I will leave you to enjoy Mahler’s loveliest work again. Maybe with new ears. These pages are maintained by Dr Len Mullenger.